Karishma Kapoor Post Graduate Scholar, Department of Prasuti Tantra Evam Stree Roga, Sri Kalabyraveshwara Swamy Ayurvedic Medical College Hospital and Research centre, Bangalore, Karnataka, India. Chethana Kumari A. Assistant Professor, Department of Prasuti Tantra Evam Stree Roga, Sri Kalabyraveshwara Swamy Ayurvedic Medical College Hospital and Research centre, Bangalore, Karnataka, India. Ramesh M. Professor, Department of Prasuti Tantra Evam Stree Roga, Sri Kalabyraveshwara Swamy Ayurvedic Medical College Hospital and Research centre, Bangalore, Karnataka, India. Anovulation is the failure to produce a mature ovum by ovary. Anovulatory factor is an important subset in infertility among women accounting about 40% of cases. In such patients ovulation induction is a rescuer. Infertility brings marital disharmony, social rejection which results in anxiety and disappointment. In Ayurveda, Vandhyatva is a Vata Dosha Pradhana Vyadi and Ovulation is under the control of Vata especially Apana Vata. Here Phalaghrita and Pushpadhanwa Rasa has been used to correct the anovulation. In this present article patient’s anovulation treated successfully. KAPOOR, Karishma; A., Chethana Kumari; M., Ramesh. CORRECTION OF ANOVULATION ONE OF THE MAJOR CAUSE OF VANDHYATVA- A CASE STUDY. 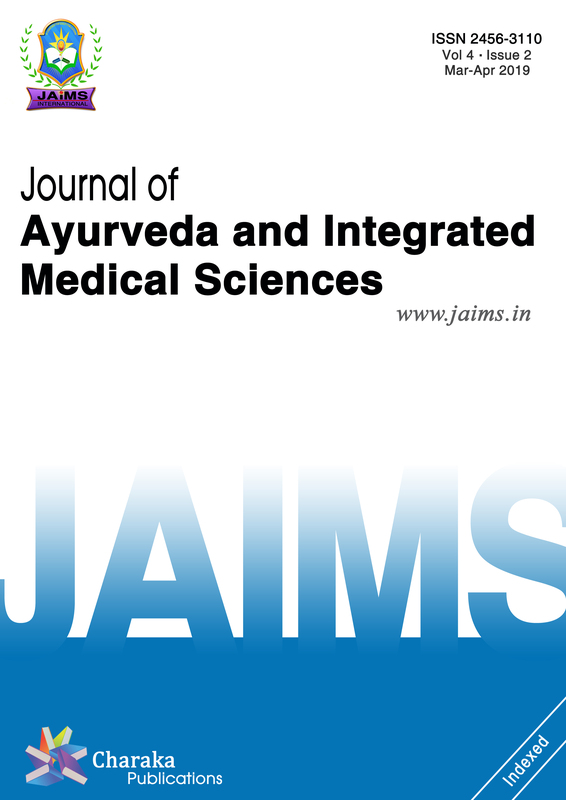 Journal of Ayurveda and Integrated Medical Sciences (ISSN 2456-3110), http://www.jaims.in/index.php/jaims/pages/view/Citation, v. 3, n. 5, p. 205 - 208, oct. 2018. ISSN 2456-3110. Available at: <https://jaims.in/index.php/jaims/article/view/679>. Date accessed: 25 apr. 2019. doi: https://doi.org/10.21760/jaims.v3i5.13845.